DIE Lunæ, 3 die Decembris. Votes from H. C. against the Canary Company Patent. Count. of Huntingdon, Privilege: Brookes, her Servant, arrested. Blagrave and Benskin sent for. Epus. Rochester. Ds. Cancellarius Angl. 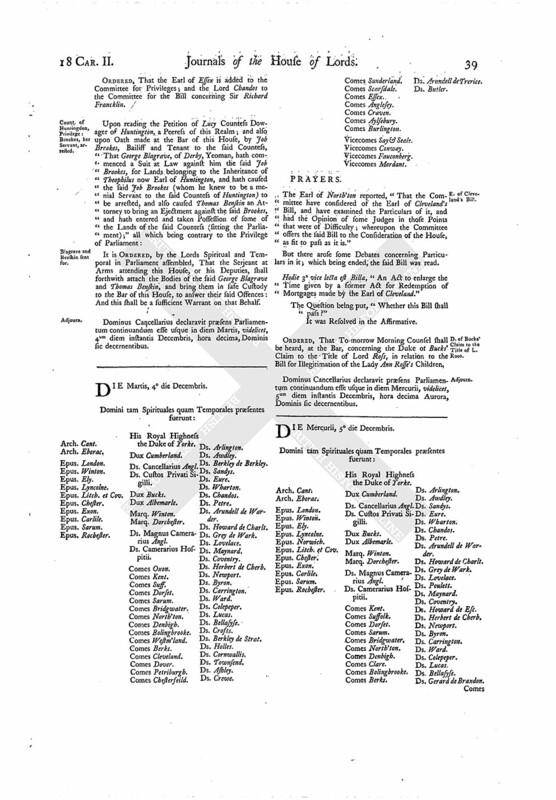 This Day being appointed to hear all Persons concerned in the Patent granted by the King to the Canary Company, but there being only Counsel appeared for the Patentees; the House took into Consideration what Course should be taken for proceeding herein, as this Business is brought from the House of Commons. For the better Debate thereof, the House was adjourned into a Committee; and, after some Consideration, the House was resumed. Then the Lord Privy Seal reported, "That the Committee of the whole House, having considered of the Votes brought from the House of Commons concerning the Patent granted by His Majesty to the Canary Company, are of Opinion, That it be referred to the Committee for Privileges, to consider what Precedents have been formerly of this or the like Nature, and report the same to this House." Whereupon the House ordered the same accordingly; and appointed the Committee for Privileges to meet this Afternoon for that Purpose. ORDERED, That the Earl of Essex is added to the Committee for Privileges; and the Lord Chandos to the Committee for the Bill concerning Sir Richard Francklin. 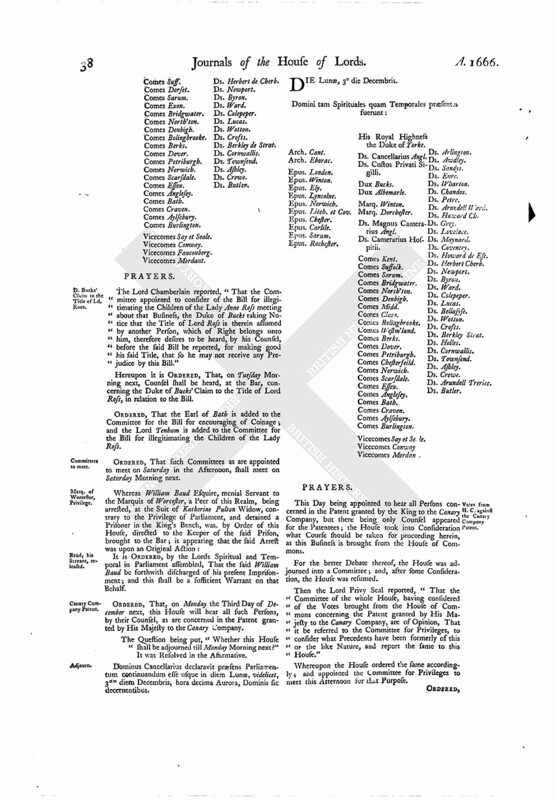 It is ORDERED, by the Lords Spiritual and Temporal in Parliament assembled, That the Serjeant at Arms attending this House, or his Deputies, shall forthwith attach the Bodies of the said George Blagrave and Thomas Benskin, and bring them in safe Custody to the Bar of this House, to answer their said Offences: And this shall be a sufficient Warrant on that Behalf. Dominus Cancellarius declaravit præsens Parliamentum continuandum esse usque in diem Martis, videlicet, 4um diem instantis Decembris, hora decima, Dominis sic decernentibus.